The MetalCloak JL Wrangler Upper Front Control Arms are engineered specifically for your new Jeep JL Wrangler and provide all the flex with the smoothest ride. 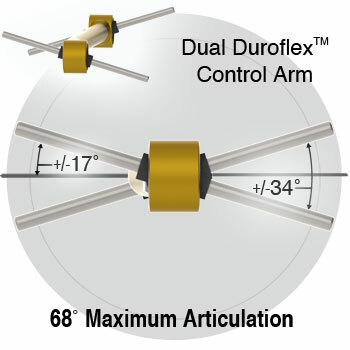 Equipped with the new standard in performance, the MetalCloak Duroflex self-centering composite bushings (metalcloakpatents.com) provide a combined misalignment of 68 degrees. Now made with DuPont™ Kevlar® fiber - the first suspension components manufactured with Kevlar® for industry leading durability. All control arms come assembled and ready to be measured for length and installed. 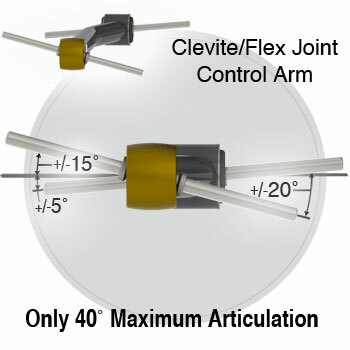 The Patented Duroflex™ Joint ( MetalcloakPatents.com) is essential for getting the greatest flex with an incredibly smooth ride that handles great. There is no substitute. 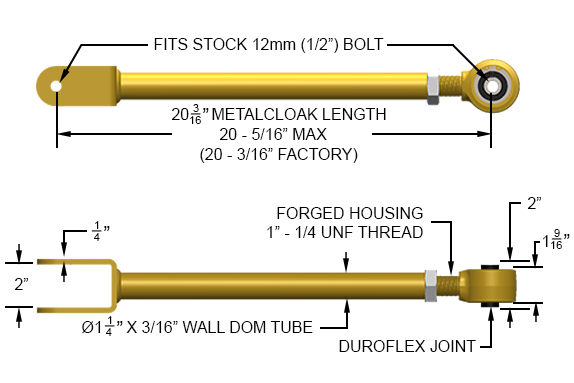 MetalCloak's Duroflex Joint provides 28˚ more articulation and flex then typical control arms! The MetalCloak Kevlar® bushings can be identified by the M located on the surface. DuPont™ Kevlar® continues to take on new challenges, their scientists are continuously innovating and working on a range of new opportunities through collaborations with communities, industrial manufacturers, and governments. Together we’re bringing the strength, durability and performance of Kevlar® to new frontiers. Kevlar® aramid fiber is pushing boundaries and defying obstacles every day. JL Factory Control Arms Stock 24" 20 1/4" 20" 17 1/2"
JL MetalCloak 3.5" Lift 5 Degrees 24" 19 3/4" 20 1/8" 17 1/2"